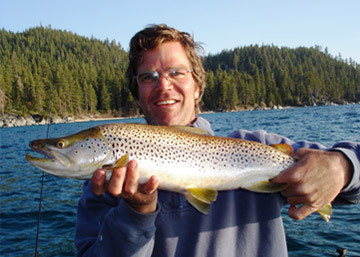 Experience is the difference with our Lake Tahoe fishing guides. As most guides would agree, success doesn't come by instinct alone (though it never hurts). But experience is the difference maker. And with over a decade of experience fishing Lake Tahoe, Gerald has parlayed his experience into some substantial success. Gerald's outgoing personality, tireless work ethic, and devotion to sportfishing started early—long before he first wet a line in the Lake Tahoe area. By age 15, he'd signed on with the overnight boats in San Diego where he logged more than 7 years in preparation for his leap into the ranks of the long-range fleet. The next 6 years, he crewed for the Royal Polaris and American Angler, fishing deep into Mexican coordinates. These long hours on the water presented Gerald with the privilege of testing for and earning his 100 Ton U.S. Coast Guard Master Mariners License. But he didn't stop there. Other accreditations include: Nevada Master Guides License; California Fish & Game Guides License. 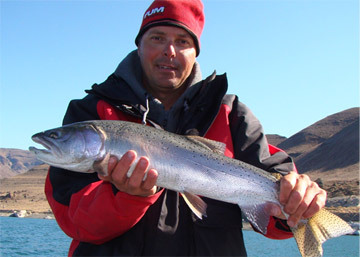 Captain Brad Bugica has been guiding since 1992, when he first acquired his California Guides License. He also holds a United States Coast Guard Captains and Nevada Department of Wildlife Sub-Guides License. His guiding experience is not just limited to fishing Lakes in Northern California for trophy Rainbows and Browns, Mackinaw, and Kokanee as Brad has spent many years guiding on the Sacramento and Klamath River systems for Salmon, Sturgeon, Steelhead, and Striped Bass. 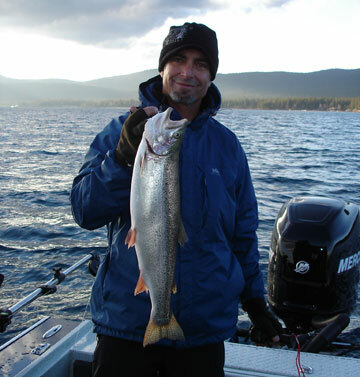 This wealth of knowledge and experience, along with his outgoing personality makes Brad a top notch Lake Tahoe fishing guide. Someone once said, "If you want to a catch fish, you need to think like a fish". It's no wonder why some folks call Phil the "Fish Whisperer" — he eats, breathes, and talks fish. Why? Phil has worked in the fishing business since the early age of 14 when he began his career as a deckhand working aboard Malibu Pier sport boats in Southern California. At the age of 20 he moved his hard work ethic and outgoing personality to San Diego and joined the overnight and long-range fishing fleet. After logging nearly 15 years in San Diego, Phil moved to Bend, OR where he continued his quest for the "fin" by chasing trophy Brown, Rainbow, & Lake Trout. Long hours on water earned Phil a number of qualifications: A 100 Ton U.S. Coast Guard License, a Nevada Sub-Guides License, and a California Fish & Game Guides License. Today, were glad he's a member of our Lake Tahoe fishing guide team. If it's passion for the "art of fishing" and selfless sharing of knowledge you're looking for, Phil's your guide.